5 good reasons to support free trade. Trade boosts economic growth and reduces poverty. Since WWII, the world has seen the collapse of communism and the expansion of international trade. Economists have long believed that both markets and trade are important contributors to economic growth and thus poverty reduction. In fact, there is a large body of empirical evidence which supports these theoretical presumptions…there is strong evidence that market economy is economically superior to socialist central planning and that trade is important for growth. 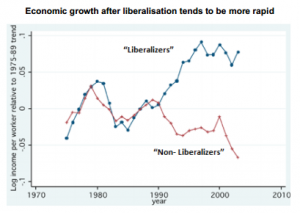 Trade liberalization, a process which entails lessening or removing government erected barriers to international trade, has been found to be particularly beneficial. 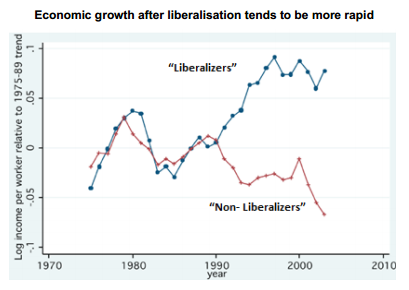 According to the aforementioned meta-analysis, the short-run costs of trade liberalization are 20% smaller compared to the average economic reform, and the long-run benefits are about 40% larger. One paper found that trade liberalization in the form of reductions of import tariffs in Indonesia lead to an increase in income among poor households, which allowed them to pull their children out of the labor force, ultimately leading to substantial reductions in child labor. One of the most common arguments against free trade is that if consumers purchase foreign goods in place of domestic goods than domestic unemployment will rise. Recently, protectionists have been flaunting research which found that import competition from China lead to meaningfully large drops in American manufacturing employment in order to justify protectionist policies. However, this revelation is not a good argument in favor of protectionism. It’s to be expected that import competition in a given industry leads to domestic losses in employment in said industry, however, the money saved by consumers buy purchasing foreign goods may be spent or invested elsewhere, creating employment in other industries. For this reason, it’s worth looking at the relationship between trade openness and unemployment on a macro level rather than a micro level. This can be done by comparing the employment outcomes of countries of various degrees of trade openness, while controlling for confounding factors of course. Trade increases compliance with labor standards. Another review of the empirical evidence published in the Journal of Commerce and Economics found that, “research suggests that trade openness may improve rather than degrade labor conditions.” Thus, the available evidence comes to a conclusion which is in complete opposition to the “race to the bottom” argument. Trade reduces the likelihood of war. Proponents of free trade have often argued that economic interdependence in the form of trade limits the incentive for interstate belligerency in the form of military conflict. This is because Classical economist Frederic Bastiat is often quoted as saying, “When goods do not cross borders, soldiers will.” Indeed, this hypothesis may actually be true. Trade makes increases life expectancy and reduces infant mortality. Herzer isn’t alone in coming to this conclusion. Two earlier papers, Owen and Wu (2007) and Stevens et al. (2013) also came to the conclusion that the populations of countries more open to international trade experienced higher life expectancies and lower infant mortality rates than those which were less open to it. Additionally, a recent analysis of 40 episodes of trade liberalization found that half of them lead to significant reductions in child mortality rates. Only in one case did liberalization increase child mortality and in the rest it didn’t have any impact. There is rather convincing evidence that freer trade policies lead to faster economic growth and less poverty and unemployment, contrary to the assertions put forth by protectionists. Furthermore, the adoption of free trade policies in the post-WWII period has been instrumental in reducing military conflicts, setting the world on path to peace. The benefits of freer trade seem undeniable, and it’s worth keeping them in mind when neo-mercantilists assert that the best means by which a country can grow rich is by engaging in protectionism and economic nationalism.